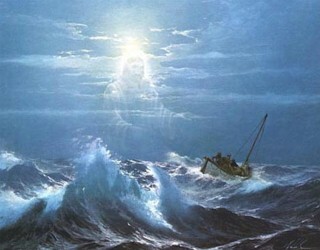 Peter showed so much faith when he told the Lord to command him to step out of the boat. He knew it had to come from Jesus and if He called him, He’d also sustain him. So what happened to his faith only moments later? I believe overcome by the scene he was in; the wind whipping up the waves, Peter lost sight of what God was doing through him. He lacked no confidence in the Lord’s ability but lost faith in his own. Again, I do not believe Peter had the power to walk on the water alone. However, he was capable when he allowed the heart of God to beat through him, his eyes focused on Jesus and believing he can be and do anything with Christ. Command me and I can do it because if you command me you will also give me the ability. Have you ever believed the Lord called you to do something specific? You were afraid but excited because it spoke to your spirit. You knew the Lord was laying this on your heart. So you stepped out and moved toward what God had for you. Suddenly the winds of life kicked up. What happened? Did you take your eyes off the Lord and become overwhelmed with where you were? Did you question if you ever heard from the Lord in the first place? Maybe you yelled out, “Lord, save me.” Or possibly you began making your own plans to solve the issue, only to see them sink. Several years ago the Lord gave me a vision for a specific ministry to leaders. I knew it was the Lord, I felt the passion stirring in my heart, but my legs went stiff. The Lord confirmed it more than once that He had put the desire there. However, I was afraid and so didn’t move forward for a long time. Often I’d use the excuse, I’m not ready yet. If I argued with my husband or kids, I’d feel disqualified. Ever felt like that? The devil is a great liar! He loves to keep us from fulfilling what the Lord has for our lives. On my prayer walk today I realized something. We’re all just jars of clay with cracks and imperfections. You might say we’re all, ‘Crack Pots’. Yet, God still wants to use us. He simply asks us to be willing vessels He can flow through. His spirit literally flows through our cracks; our brokenness, our fears, our mistakes. He flows through the cracks of our humanness and touches the lives of others, giving Him all the glory! He’s not asking us to be perfect, just perfectly willing and available to Him! What if Peter hadn’t doubted what God could do through his own scars, insecurities and fears? What if he had taken a deep breath, looked back to the Lord and said, “I can do this if you stay here with me.” I wonder how many more disciples may have gotten out of the boat? The lesson here is how often do we in our leadership roles, trust what the Lord can do through us? How often do we draw confidence in knowing if the Lord calls us to a task, He will equip us to carry it out? What has the Lord called you to do? Where is your doubt the strongest? Turn it over to the Lord, do it afraid if you must but do it! It’s not about you anyway, it’s about trusting what God can and will do in and through you. This is my heart for leaders, to help them be all the Lord has created them to be and not doubt the gifts and the talents the Lord has given them. To be men and women capable of walking on water as they keep their eyes on the Lord, knowing it’s His ability flowing through them! There is one more powerful lesson for us to glean in this story … Next Blog….